White captions are hyperlinked, black ones provide mouseover ‘tooltips’, but who knows what a winter shot with snow might do to my colour scheme? For those interested in replicating my viewpoint, the photos are taken from a scoop-topped boulder above Creagan Sgiathan at NN 19687 62478 (GPS accuracy was showing about 20–30 ft when I marked that position) and altitude of c.1,040 ft (it’s on the 320m contour) as shown by the map and further images below (added June 2010). There’s also a slowly expanding collection of panoramic shots of the village and surrounding area here to look at. This panorama of the Mamores under snow was taken from the Penstock, where the conduit from the Blackwater Dam meets the pipes that carry the water steeply down to the hill to the Powerhouse. From left to right, the main peaks visible are Mullach nan Coirean (behind the tree), Stob Ban, Sgorr an Iubhair, Am Bodach, Stob Coire a’ Chairn (left of centre), Na Gruagaichean (right of centre), the South Top of Binnein Mor, Sgurr Eilde Beag and Sgurr Eilde Mor. 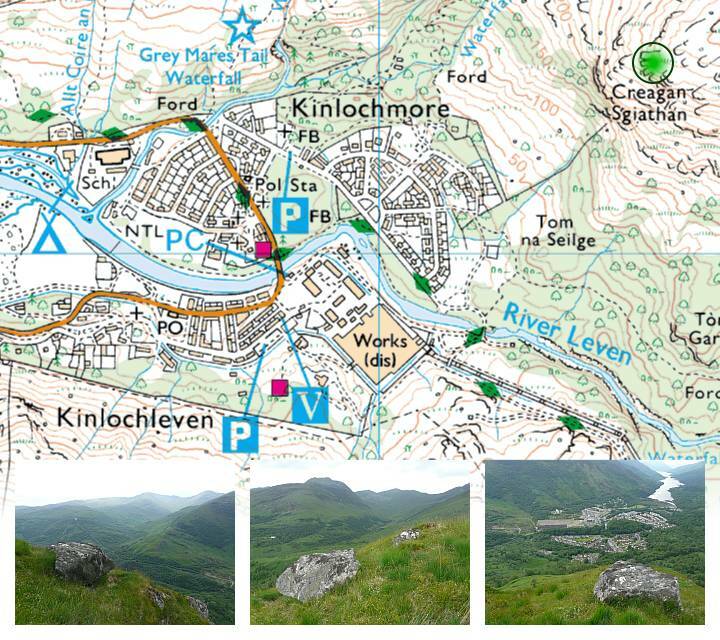 What’s visible of Kinlochleven is largely obscured by deep shadow to the bottom left, but the viewpoint for the main photo above is basking in the sun above the obvious large crag to the right of that. This second panorama was taken from Meall an Doire Dharaich, which is the rounded foreground hill to the right of the crag (Creagan Sgiathan) in the first one. The most obvious peaks, from left to right, are Garbh Bheinn (not to be confused with the famous Ardgour peak of the same name), the Pap of Glencoe, Beinn na Caillich (to the right of the Loch), Am Bodach, Stob Coire a’ Chairn and Na Gruagaichean, but keen eyes should also spot Beinn a’ Bheithir behind the Pap, Mam na Gualainn behind Beinn na Caillich and Mullach, Stob Ban and Sgurr a’ Mhaim behind Am Bodach. This view from Garbh Bheinn was stitched together two years late from three photos I possibly intended as a panorama but forgot, with the end result certainly an improvement on the constituent parts. The main features shown are the central peaks of the Mamores with Ben Nevis etc. behind (left); the eastern Mamores, Lochs Eilde Mor and Beag (centre); and the Blackwater Reservoir (right), with Mamore Lodge and the Estate cottage also visible above the (hidden) village. 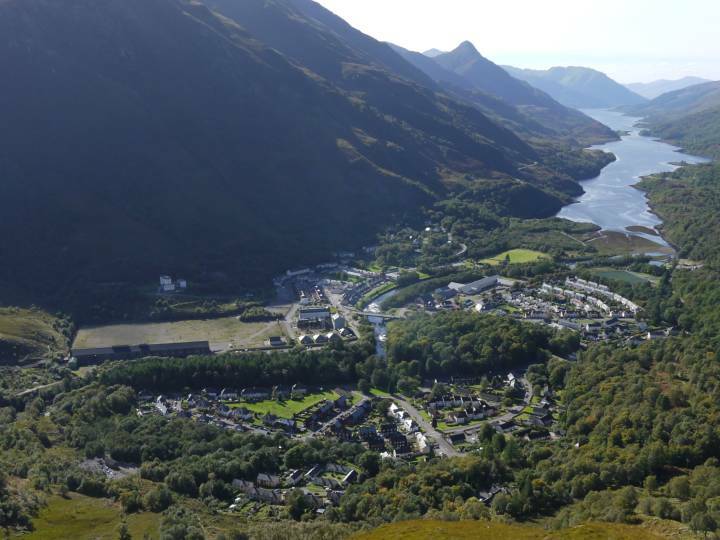 While Kinlochleven undoubtedly misses direct sunlight during the winter months, the combination of high sunlight and extensive valley shadow in this case comes from the photos being taken at about 8:25pm on a summer evening. This (approximately 180°) panorama from the east top of Mam na Gualainn shows the Mamore range, Beinn na Caillich, Kinlochleven with the Blackwater Reservoir beyond, Garbh Bheinn, the Caolasnacon campsite with Stob Dearg (Buachaille Etive Mor) just peaking out above the glen behind, and the Aonach Eagach.